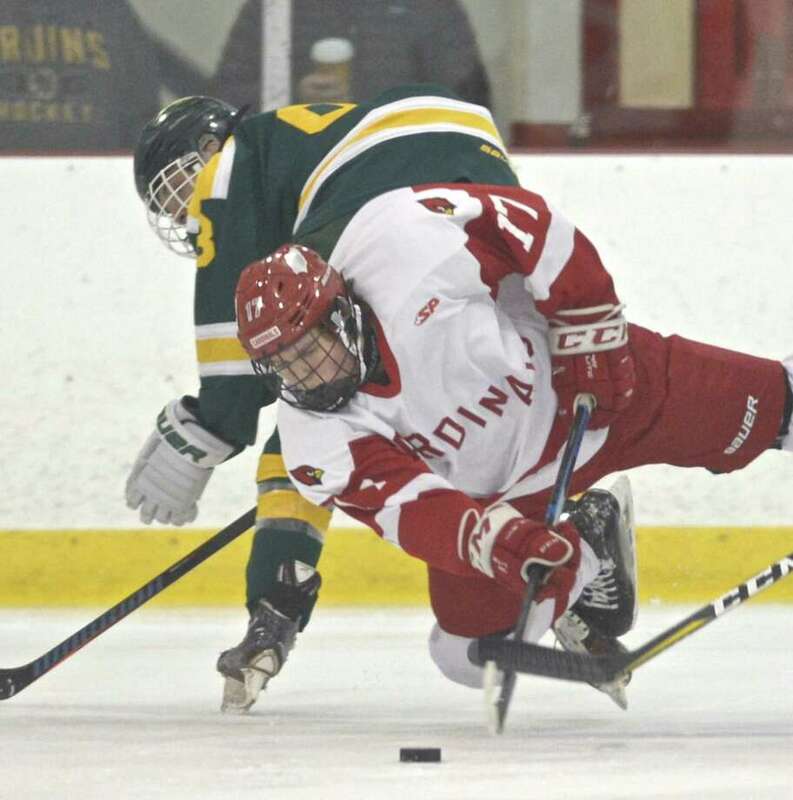 Greenwich's Thatcher Danielson (17) gets airborne as he goes for the puck in the boys ice hockey game between Hamden and Greenwich high schools, Tuesday night, January 2, 2019, at Dorothy Hamill Rink, Greenwich, Conn..
John D’Errico, Notre Dame-West Haven: A goal and two assists in a 7-1 win over St. Joseph. Tag Weiss, Masuk: Made 43 saves in the Panthers’ 3-2 overtime win against Newtown. Fairfield Prep at Ridgefield (Winter Garden), Wednesday, 7:30 p.m.: Maybe the game of the second half, a rematch of the preseason No. 1 (the Jesuits’ growing pains seem to have worked themselves out, and we’ll see how far they’ve come) and No. 2 (the Tigers immediately took over No. 1 and haven’t lost and haven’t looked back). Amity at Cheshire (Wesleyan), Saturday, 6 p.m.: This game is why Guilford can clinch with a point on Wednesday: Somebody has to lose at least one point here. They’re jostling for position in a couple of Division II tournaments. Sheehan at LHK (Northford), Saturday, 8 p.m.: Three weeks after the co-op’s 3-0 win in front of a packed house at Wesleyan, they’ll meet again. The Trojans have an edge for second place in the CIAC Division III standings as the week begins. Darien at Greenwich (Hamill), Monday, 4:30 p.m.: Until last week’s win over LaSalle Academy (R.I.), the Cardinals hadn’t seemed to have their mojo since their Dec. 29 win over Darien. Their regular season ends here with the rematch.